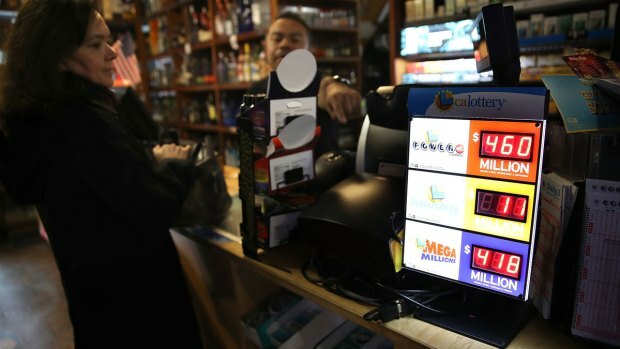 In this Jan. 13, 2016, file photo, a customer buys Powerball tickets at Kavanagh Liquors in San Lorenzo, California. The Powerball drawing took place Saturday night, offering players a $495 million jackpot — the 8th largest in the lottery game’s history. The winning numbers are: 30, 34, 39, 53, 67 and the Powerball is 11. The estimated cash option is $300.2 million. The Powerball jackpot was last hit in New York in the Dec. 26 drawing. Since then, there have been 22 drawings in a row without a jackpot winner. Two tickets in New York matched all five white balls, but missed matching the red Powerball, in Wednesday's drawing to win a $1 million prize. One ticket in Florida matched all five white balls and doubled the prize to $2 million because the ticket included the Power Play option.